Fall Harvest, Halloween Screams, and Christmas Galore. We Found Amazing Ideas for Your Porch Décor! There is something about summer coming to an end that makes us want to “deck out” our porches for the fall and winter holidays. Whether you like classic cornstalks for autumn, scary pumpkins for Halloween or white lights and green garlands for Christmas, there is something for everyone when it comes to creating a festive and beautiful holiday space right outside your own front door. Enjoy the Archadeck Holiday Porch Décor board on Pinterest to see all the ideas we have found. Whether young in age or young at heart, everyone has a favorite Halloween movie or character. 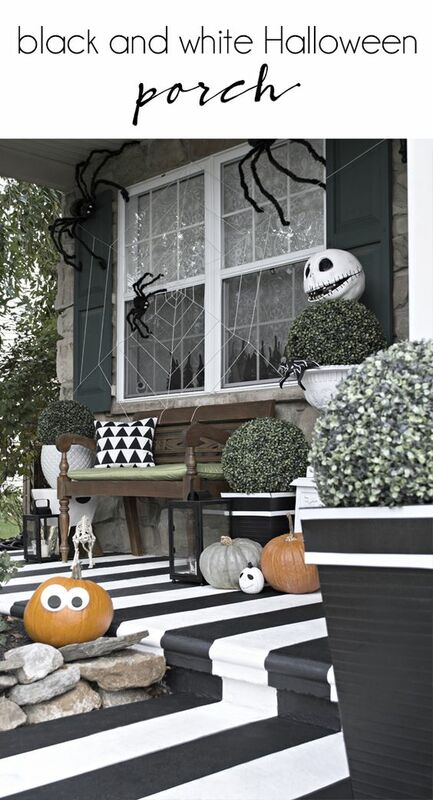 We love this creative use of black and white to create a front porch theme inspired by The Nightmare Before Christmas. Take a look at the black and white painted porch floor – what commitment! Are you game? Even with more minor touches, you could show your love for Beetlejuice too. For a subtle bit of fun, these DIY witch hat lights do the trick. 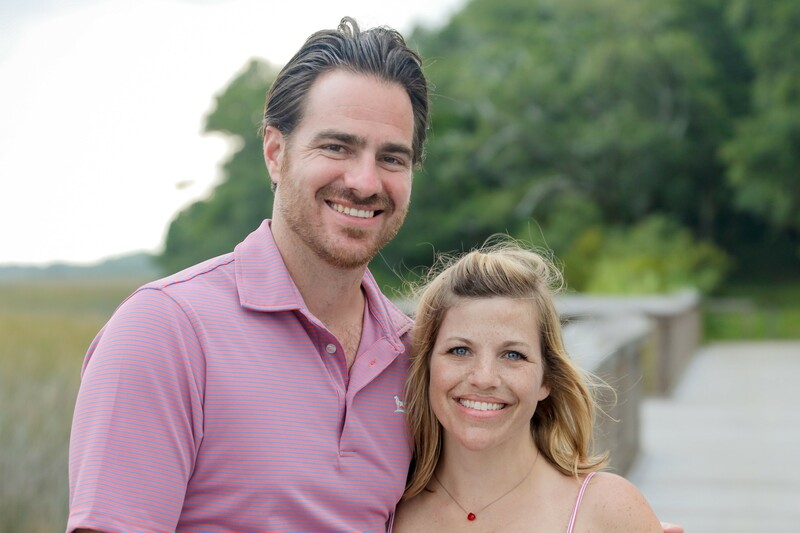 They are fun and festive without being over the top. This fantastic idea could be implemented in different items for different holidays too. Up next? Santa hats for Christmas! This classic and cozy Fall and Halloween décor combo will take this porch from early Autumn, through Halloween, to Thanksgiving. The cornstalks, pumpkins, and corn cobs are a fan favorite and the welcome sign adds a bit of today’s trends to this quintessential fall porch. 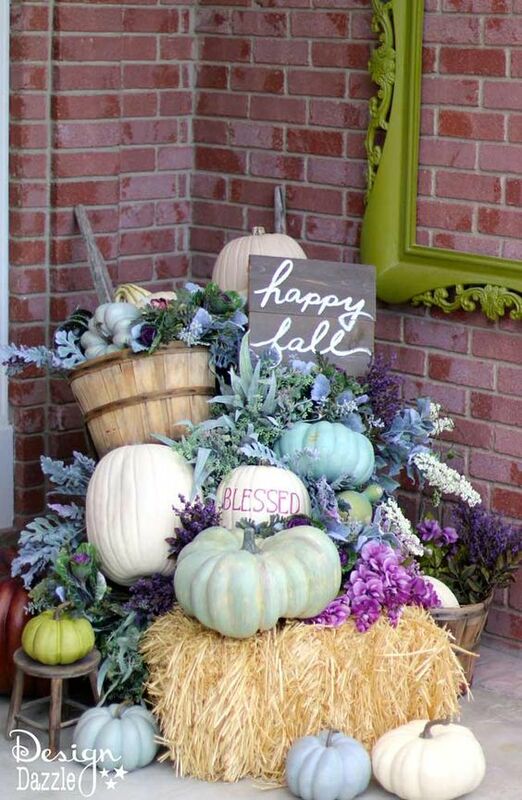 We love this updated fall color palette for pumpkins and harvest time. Inspired by fall cabbage purples, this porch features pastel shades of green, turquoise and cream with spectacular pops of deep cabbage purple. Without a single hint of orange or gold, this porch pulls off the autumn look with a fresh style and cool color palette. In recent years, whites, blues, and silvers have become an eye-catching trend for Christmas decorations. We love this subtle, simple, and chic Christmas front porch that lacks any trace of red or green. The greenery mixed with brown pine cones and white and burlap swag give this Holiday front porch a photo-shoot ready feel. Taking the indoors out hits a whole new level with this holiday front porch décor! Cushioned seating with rustic blankets, rimmed in lights and candles, make you want to post up with a cup of hot cocoa for a while. The flashes of Christmas evergreen with beads of red lighting add just the right touch of holiday flair. 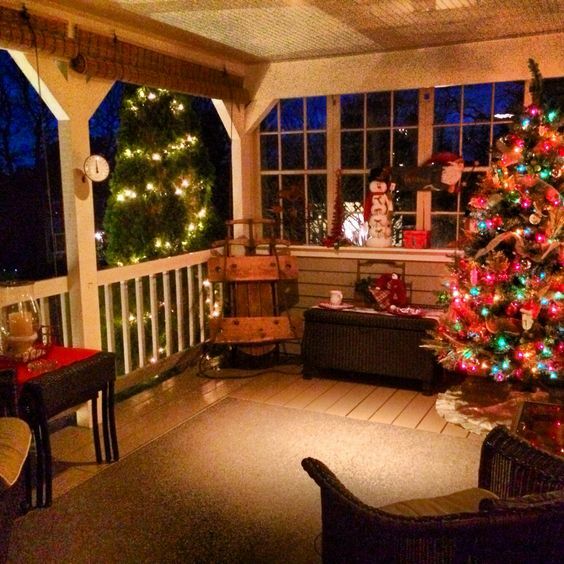 This comfy back porch can’t go wrong with the classic Christmas tree in the corner. The nearby sled and snowman on the windowsill add a timeless and wintry feel that can continue to please after the holidays and Christmas tree are gone. Are you ready for a little holiday spirit? Grab a cup of coffee and take a look through the Archadeck Holiday Porch Décor Pinterest Board. Find some inspiration for your own front porch decorating today!